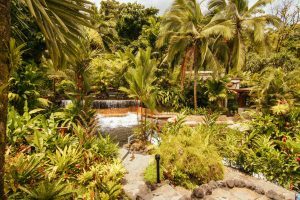 Tabacon Thermal Resort is located right beneath the towering Volcano Arenal, set among tall trees and rivers flowing all around you. The warm air, singing birds, and the sound of flowing water brought immediate relief and relaxation. If you’re looking for a peaceful day filled with nothing but delicious drinks and pure, natural relaxation, you’ll find it here. A half-day pass includes lunch and is more than enough time to explore the lush grounds. Upon entering, there’s a large pool, just like a normal swimming pool, with an inset swim-up bar. It was hard to wrap my head around the fact that this water was about 100 degrees naturally: I couldn’t wait to experience it myself. One tip: don’t just go to the first pool you see—there are a dozen hidden pools that you can explore around the property. Tabacon is full of winding pathways and bridges that take you to your own magical oasis in the trees. You’ll feel like you are the only person in this majestic forest as you explore and wind along a trail up toward the gardens. One of the winding paths led to a perfect pool amid the cascading waterfalls and heavily forested area. I stepped in, knowing it was warm but simply not expecting it, and I could feel the heat immediately run through my body. I dove in, and the only thought I had was, “this is extraordinary.” At about 103 degrees Fahrenheit, the river was heaven. After several hours of exploring secret pools, it was time to test out the swim-up bar. A water slide ride lands you in the main pool, just a short swim away from a piña colada. Next to the main pool, is a cold plunge pool—welcome relief after a morning of steaming baths. The half-day pass includes a seated, three-course lunch in their restaurant. As my first meal in Costa Rica, it left me excited to explore the flavors of the rest of the country. After a full lunch complete with decadent, fresh ceviche and sea bass, I was sufficiently relaxed and ready to make the drive to the Gulf of Papagayo. 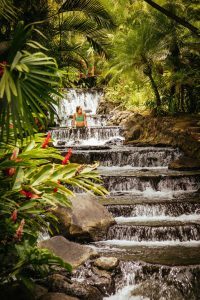 After a lot of research on the thermal hot springs in Arenal, the stunning natural property of Tabacon Thermal Resort far outperformed any other property. While the cost of visiting may seem high, at around $80 per person, it’s worth it for the seclusion, privacy, and truly picturesque landscape that you can’t help but explore during your time on the property. I recommend reserving your date in advance (you can do this on their website), as they do fill up due to limited capacity.